Unique or Cool Features: The Everyday Grilling Section in the beginning of the book guides the reader through everything from Getting Ready to Grill to what every "griller" should have in their Toolbox to Cooking on Charcoal Grills (Direct & Indirect Fire) and different types of woods to use to Gas Grilling. Also included is a list of Specialty Grill Gadgets and Techniques and a guide to Using Rubs, Marinades, Bastes, Mops and Finishing Sauces. A Metric Conversions and Equivalents chart is tucked into the back of the book. My Thoughts/Review: This pint-sized cookbook packs an enormous punch. Seriously, don't let its size fool you. Bright, eye-catching photos abound in this small cookbook that features 50 recipes ranging from appetizers to desserts. While the recipes center around the grill, there are also condiments and side dishes that don't require a grill...but accompany the foods that you do cook outside very nicely. My mouth waters...I mean, it actually does...every time I page through this book. I think it would make a great addition to any cook's kitchen, from the weekend griller to the seasoned chef. So many fabulous ideas, flavors, and combinations. The book sound great. It's a fitting post for today as I received a new grill cookbook in my Williams Sonoma fathers day package. Hmmm maybe I'll do a reveiw on it after the first recipe. Have a great Sunday! Great review, the recipes you listed to try sound delicious and the one you did try looks fantastic. My mouth waters just looking at that picture. 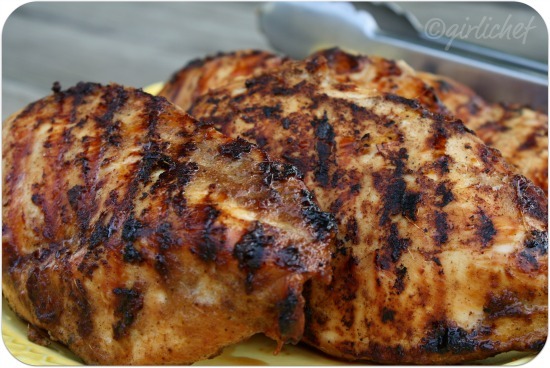 I love chicken off the grill. I am always looking for a good grilling book! our apartment doesn't allow grilling, boo! 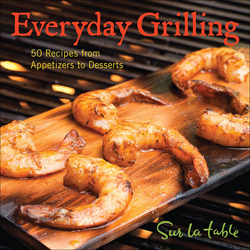 but if it did, i would definitely be picking up this book, i love grilled food! Holy cow that chicken looks wonderful! We can always use help with the grill and this looks like the perfect little book to add to my collection. This book is sitting in my review stack. ;-( I need to pull it out and start cooking from it. Loving the Five-spice on that chicken. For some reason I don't have much variety in what I grill. After reading your review, I really must make and effort to try somethings new. Thanks.